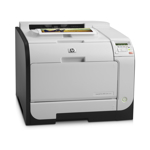 HP LaserJet M451DN Expert Reviews - Read Reviews and Buy Smarter Online. Verdict: I was a little concerned since this was an open box, but it turned out that it had only printed 5 pages, and I couldn't resist the $275 price. Judging by the paper settings, I'm guessing the previous owner had a problem with printing envelopes. Verdict: I have only been using this printer for a few days and I've not had a chance to use all of the features yet. However, I have printed a few color pages that turned out very good. Verdict: Prints color images a lot clearer then I had expected. I have the printer setup as a network printer and the installation was pretty straight forward for me, just set the IP I wanted the printer to use on the printer before attaching to the network and everything fell into place. Great price, excellent HP quality, fast delivery. Verdict: I bought two of these printers for work, having been a fan of HP lasers for the last 25 years. They don't fail to impress - fast and quiet, easy to set up, support AirPrint for the office iPads, excellent print quality, and look good! Toner cartridges super easy to swap out, no downside so far! Verdict: This is the fifth Laserjet Pro 400 that I have purchased for my office. Performance and print quality are excellent. I have been very satisfied with this particular printer. Easy to set up right out of the box. I would highly recommend this printer to anyone. Verdict: I had the laser color printer 2025 and really liked it and it did a great job until it got old and lost it's memory. Would have been nice for the cartridges to fit the new one. Verdict: This printer is great. First of all, hp website is so easy to use. Ordered at a great price & cartridges at a discount. Got it delivered in a couple of days as promised. Set-up was phenomenal - so quick and easy! Will recommend to friends based on the features. Verdict: Print quality is very good, speed is good, even with large files. Hope if has USB printing but consider the price I paid, it is fine. The quick form printing, and double side printing feature is very convenient.